Edric and I are privileged to be guest speakers at an event in Singapore called, Before I Do, which will be held on August 18, 2012 at Kembangan Plaza. We have been a part of this twice a year event, which is normally held in Manila, for quite some time. 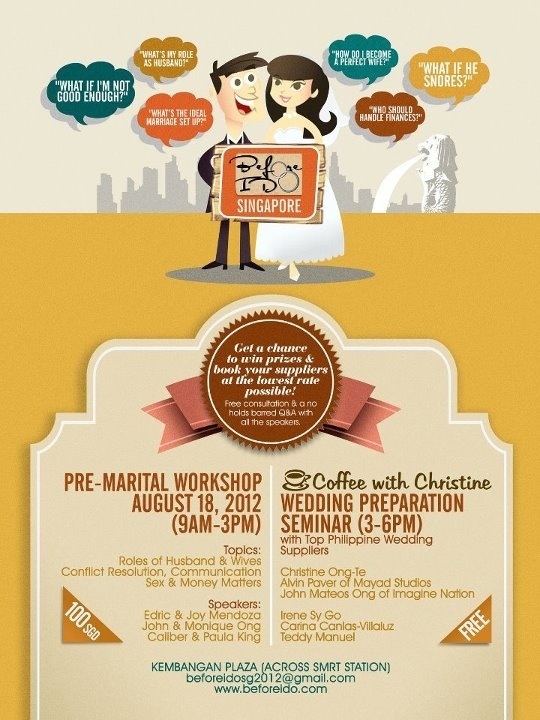 Organized by our dear friends, John and Monique Ong, who are in the wedding industry and have a photography company called Imagine Nation, this event targets engaged couples to prepare them for marriage. This year, we are actually doing the seminar in Singapore. What a blessing! Edric and I have always been burdened for young couples and families so this is one of our advocacies. We don’t get paid to do this but our great reward is seeing couples start their marriages with the right foundation. If you happen to be in Singapore or know friends and family who will find this workshop relevant, then I hope this event can be a blessing to you. Check out the site Before I Do Workshop for more information or email beforeidosg2012@gmail.com for questions and concerns.